Online news organisations, including Business Insider, are racing to create videos, driven in large part by Facebook’s push to show more video in people’s news feeds. One Facebook exec even recently said that she thought Facebook would be “all video” in the next decade. But the rush to declare online text dead is premature. A recent poll of 50,000 online users conducted by the Reuters Institute for the Study of Journalism found that only 24% of people had watched any news videos online in the last week. 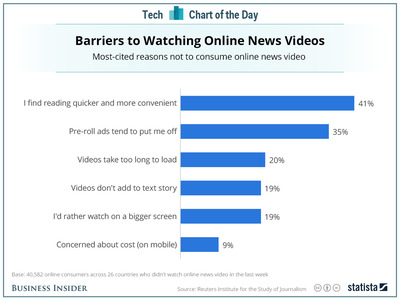 This chart from Statista shows the reasons why people say they don’t watch news videos online. The number one reason: reading is faster and more convenient.